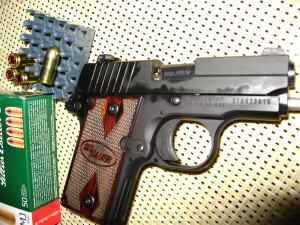 My Sig P238 has been a decent shooter, but never a 100% reliable. I kept it cleaned and lubed it according to Sig specs (not too much oil), hoping that one day after the initial break-in period a miracle would occur and my little Sig will be problem free. Well, that didn’t happen, instead I got a problem I’ve never experienced with any gun I’ve shot. 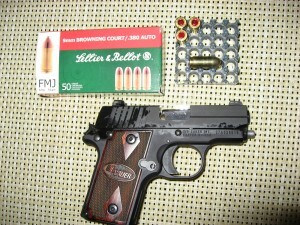 I was finishing a box of .380Auto Sellier & Bellot. 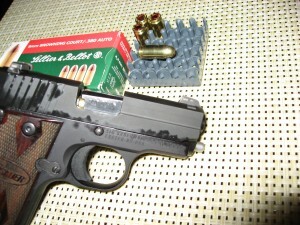 I inserted a new loaded mag (6 cartridges) and fired the first shot. 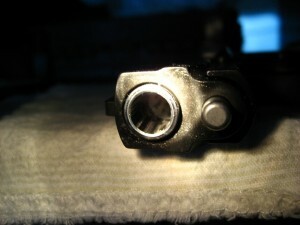 The slide moved back about a quarter of an inch and the gun got stuck with an empty shell still in the chamber. After dropping the mag, I made sure the gun was safe and tried to clear the chamber by pulling the slide back with no success. It got stuck so badly that no matter how much force I used it wouldn’t even move a millimeter in any direction. I called our experienced range master who inspected the gun, making sure it’s safe and brought it back to his office. He put some oil on the gun (the excess oil is seen on the pictures above), and after several attempts to clear the pistol he plainly said : you need an experienced gunsmith, and recommended one. I’ve purchased my Sig a little while ago, and still have the original manufacturer’s warranty. I hope this problem could be resolved without wasting too much time. I will be updating this post on how the whole ordeal goes down. 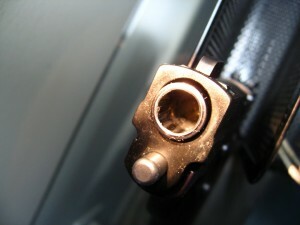 I’ve inspected the barrel more thoroughly and found a bulge about 1 inch from the muzzle. It looks like a bad Sellier & Ballot ammo caused the problem. Called a gun shop where I bought the Sig, and they nicely offered to look at it by their gunsmith… Hope new barrel will do it. This entry was posted in Firearms and tagged gear review, Sellier & Bellot, Sellier & Bellot Squib, Sig 238 Squib, Sig P238, stove pipe on September 15, 2014 by GunGuy.